Ants are everywhere. They are known for being hard working and for doing things together as a team. 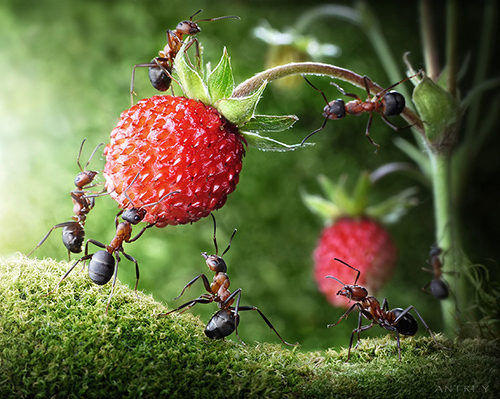 We cannot doubt that ants are one of the most amazing creatures here on Earth. Their synchronize actions, their ability to trace back home no matter how far they are from it and their commitment to their tasks are indeed fascinating. 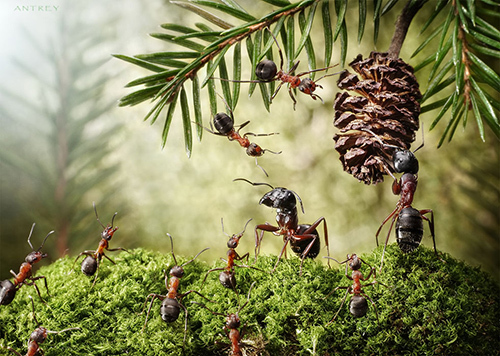 We can really get a lot of important lessons from ants. When applied in real life, we can all be successful. But we are not gonna tackle on those lessons today. 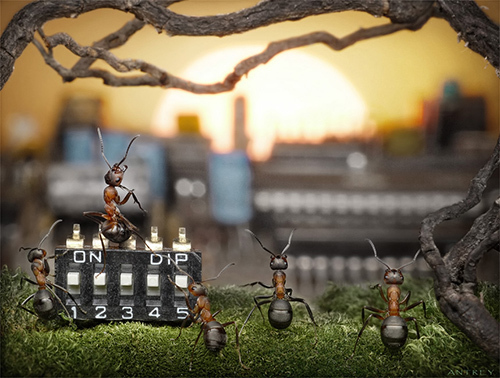 We will be showing you the amazing photography work from Andrey Pavlov with real ants as actors in the scenes he creates. 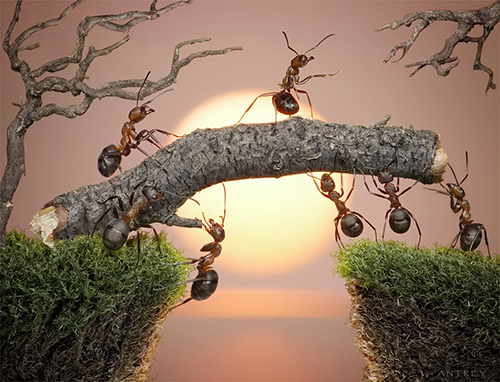 The story of Andrey Pavlov is as inspiring as the ants. He was a polar explorer after he graduated from the Arctic Faculty of the Admiral Makarov State Maritime Academy. But when his limbs were paralyzed due to spinal injury, his artic expeditions have stopped. 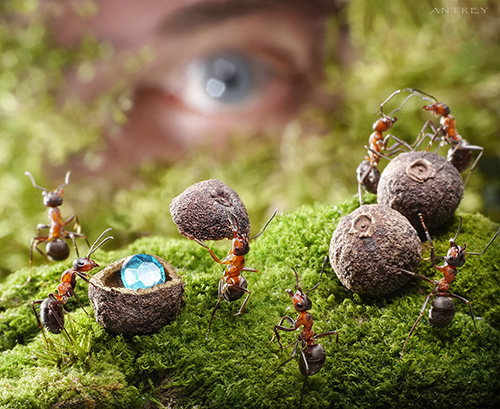 During this time, Andrey found a different passion and was inspired by his tiny ant neighbors. “I studied the ins and outs of digital photography on a square meter of grass beside my country house, with all its inhabitants included. And I was fascinated by them. It was actually the ants that helped me get through the critical situation,” Pavlov said. 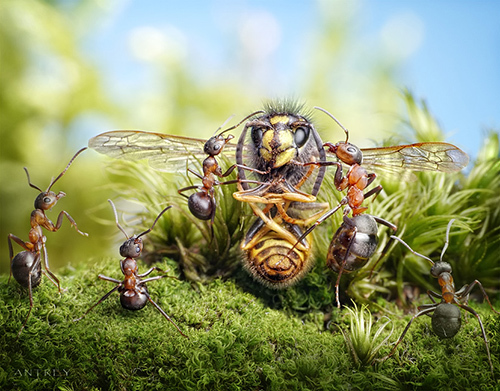 With that, Andrey spent time taking pictures of the red wood ants, Formica Rufa, that inhabit an anthill 50 yards from his house using micro 4/3. He would create a scene right in the middle of the path where the ants go in order to get their attention. He would also place a flash light, backdrops and reflectors to complete a scene. 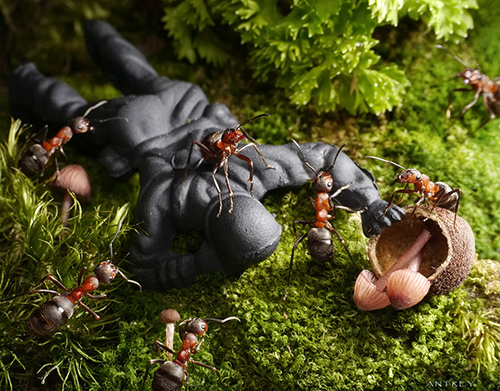 He said that it wasn’t difficult to get the attention of the ants because a dummy prey or an enemy will immediately drive the ants to it. 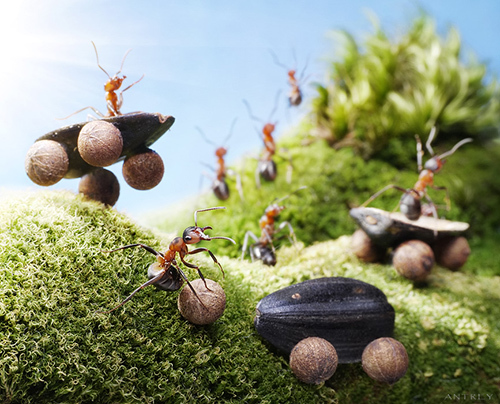 For two to three years, Andrey or Antrey, the king of ants was able to master the skill of photographing live ants. He would even look at the anthill and imagine what kind of pictures he can take from it. He would take around 20-30 shots in an hour if the weather is good but sometimes it also take hundreds of shots. After that, Antrey will add some additional collage in Photoshop. Wanna see how his output looks like? Scroll down and see a showcase of some of Antrey’s photographs which he calls Ant Tales. Before a long day of photo shots and fun, Antrey says good morning to his little buddies. Yes, it is indeed a beautiful life especially if you get a good view of the rising sun. 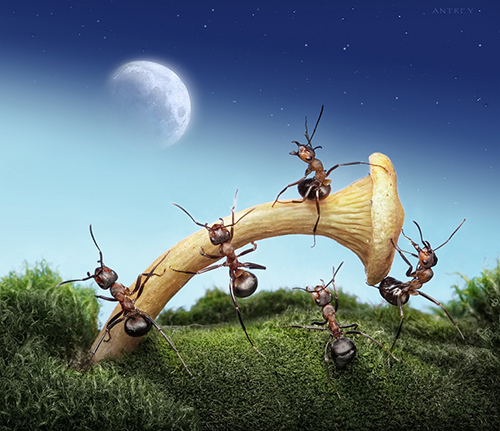 These ants know the story of Alice in the Wonderland because they think that eating a mushroom will shrink them. How small would they look when shrunk? I just can’t imagine! 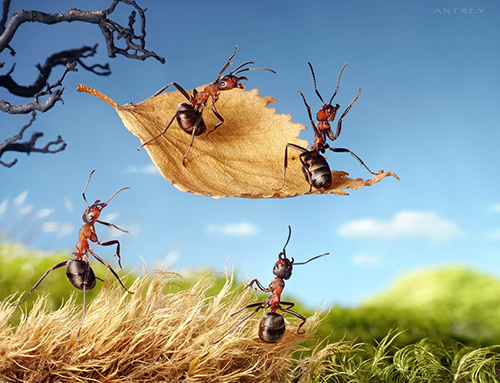 Ants can’t fly but with these leaves and with a big dream, nothing is impossible. 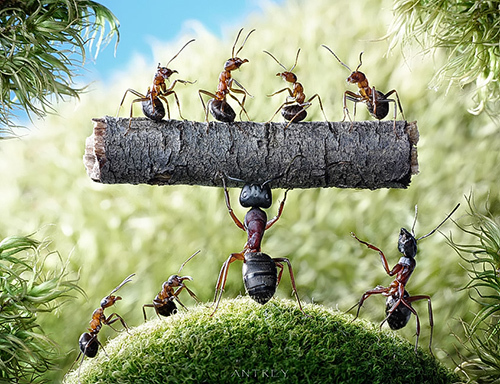 This ant has bear like strength! He can even carry a wood with other ants on it. It must be really strong. This sure is a delicious pick. I can see a feast on berries after this. Work time is also fun time. 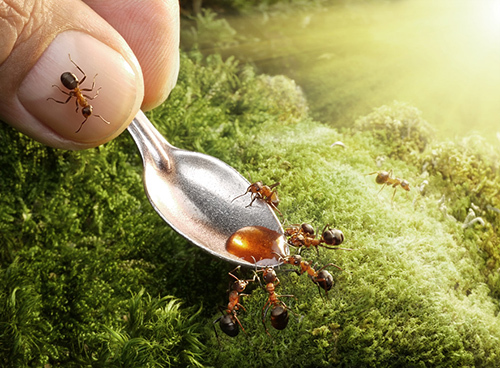 While taking food for the colony, ants can also take their own doses of sweets. These ants are wondering who owns this cone in the forest. Well, we just hope that curiosity won’t kill an ant. A simple colored stairs which was successfully climbed by the character at the top. These ants are not just learning to write but they have that initiative on how to innovate paper and pen. 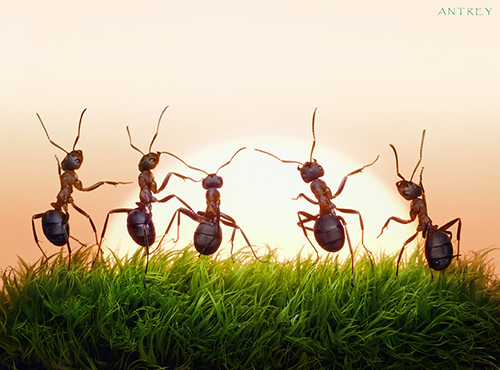 These ants are hardworking, they are already up to stay on guard during sunrise. Aren’t they sweet? Well, ants can also be loving. 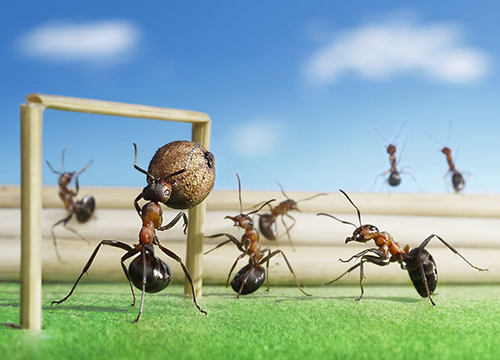 Sporty ants playing their own version of volleyball. The cheerers in the background sure made the game a lot more fun! 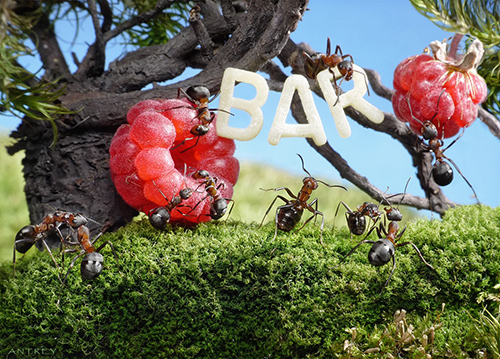 Seems that these ants are having a great time at the bar! Others are dancing while others are munching on sweet berry treats. Gotcha! The pair of eyes will follow these ants wherever they are bound especially that they have a gem with them. Enjoy your meal little ants. That sweet thing on the spoon sure looks yummy. It would really be bad to work without pay. 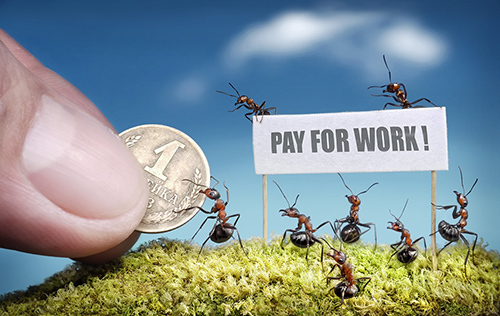 Fight for your rights little ants! The race is over. The winners and the losers are obviously seen here but the loser sure had a bad day with a car wreck. Working together to create a bridge. For sure it will be done in no time. Tell the Kids a Story, Grandma Bee! Listening to stories from the old times is always great. Look at how attentive the ants are to Grandma Bee’s story. Building a house is much more easier once they all work together. The framework is here now, the entire house will be completed soon! For the Mother-in-Law Soup, Say? What happened here? These ants were really up to something. 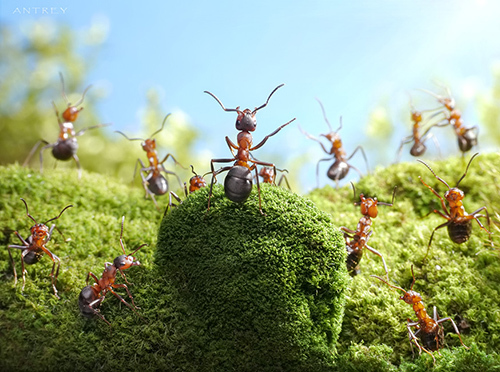 Ants respect their leader. Their leaders are also good in dealing with his subordinates. You can see that good relationship in this scene. 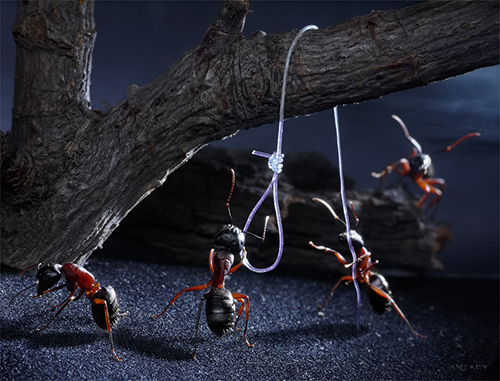 A sad scene with one ant to be given his sentence. Look at the other ant that really looks so sad. 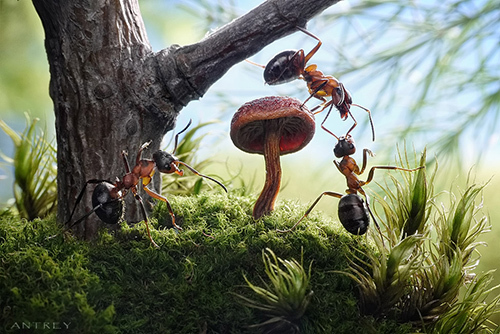 So the ants have launched something really great and new – with a mushroom. Wondering what these ants are up to? Well, it’s like they are going fishing. Maybe trying to get fishes smaller than ants! 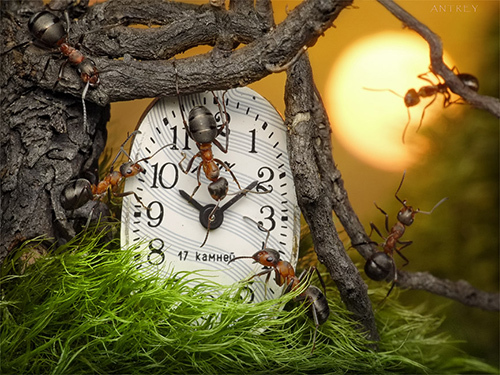 Time keepers are here but what we can actually see are seemingly curious ants swarming around a tiny watch. The sun in the background adds drama to the scene. Wee! Flying high with these lovely umbrellas. 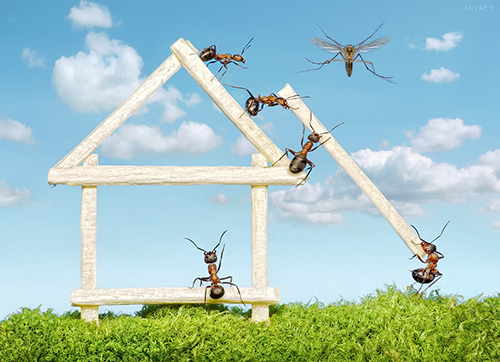 Ants can certainly be creative and adventurous sometimes. Hmm..so this is the scene behind the photos. Antrey is quite mandatory! Ooppsie! 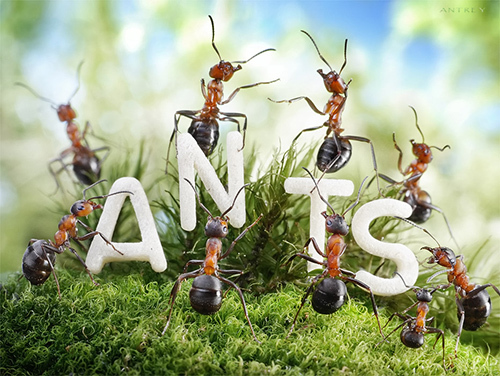 The ants have taken away Antrey’s woods. 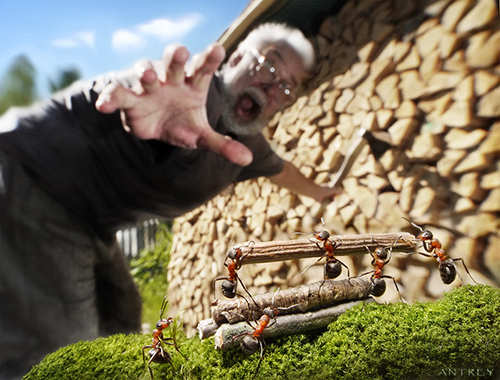 Oh, he had a hard time axing, do you think these ants are kind enough to give back the woods? 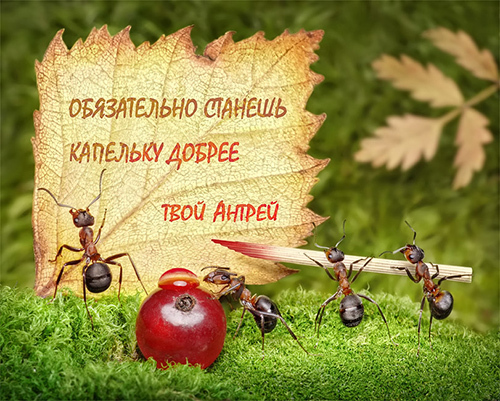 Andrey Pavlov had indeed developed his passion in photographing ants. 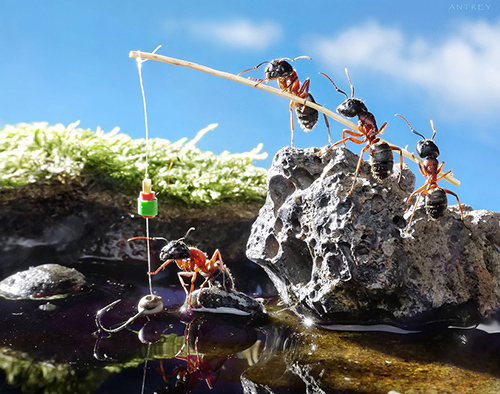 The scenes he created were very creative letting the ants act like human while remaining in their own environment. Antrey successfully showed us the intimate world of ants giving us a different perspective of our world in a smaller scale. For sure you had a great time looking at the work of Antrey. 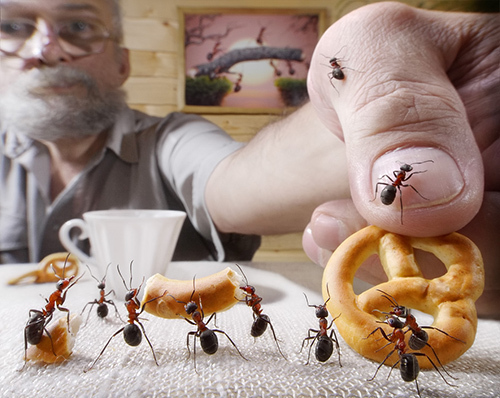 You can see more of his photos in his Ant Tales portfolio at LensArt. 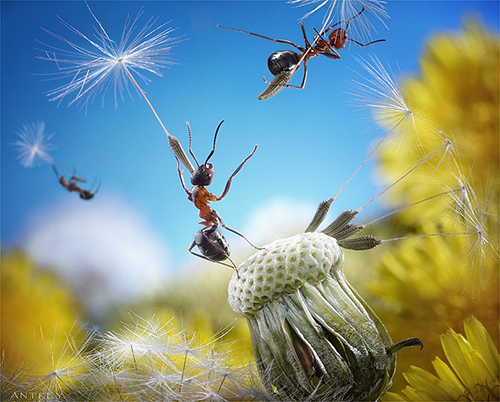 Are ants really do those things or Antrey just done it with the help of computer to make it more realistic? AMAZING PHOTOGRAPHY!! 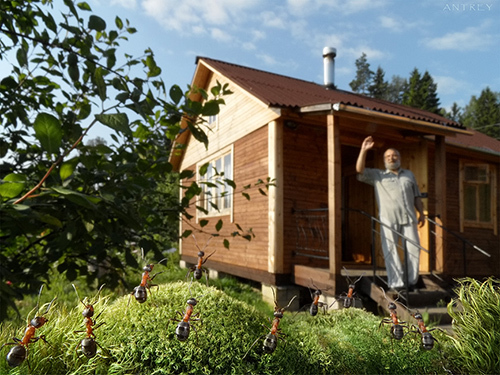 !The ants will really inspired people. 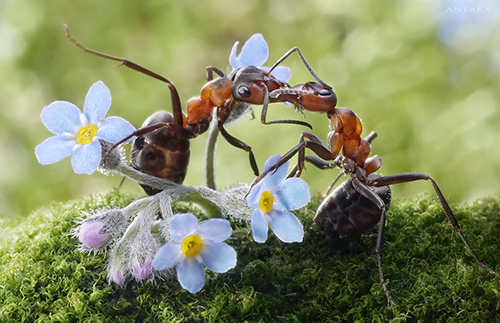 Nice shot for good morning,it seems that the ants also replied on the greeting of Antrey. Andrey is a great photographer for me base in this post.He has a wonderful talent! Impressive!! 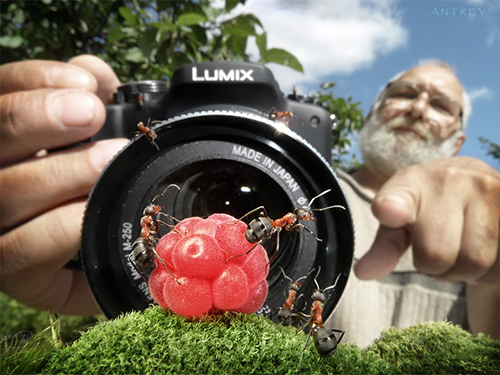 !This is a tough job,to take picture of an amazing scene of ants activities. I love Andrey for being patience in doing this things,bravo!! This post is very entertaining and I really enjoyed scrolling down.